Errol: You know, I don’t know how much background to give to these comics because I don’t know if I will use it yet in a comic. Debs sent me a conversation she had with Alina, and I split it into two comics. I’m not all that keen on the wording in this comic, because for those that may be new to the comic, they may think… heck… who knows WHAT they would think? 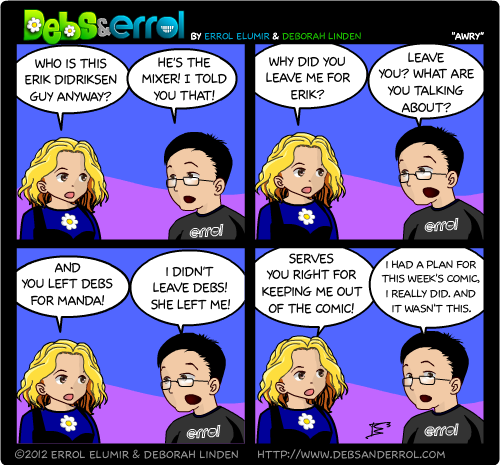 Okay, here is the verbatim conversation I had with my mom on Monday while she was catching up on the comics. mom: who is Erik Didriksen? d: i told you, he’s our mixer. d: yes. that’s his first name. m: oh. is he german? m: you know, i think i would look pretty good beside this erik. me, the hot blonde. m: you know, i should tell errol that i’m sad because he left me for erik. and he left you for ‘manda. hahaha! a support group. I have such a crush on Cartoon Debs’ Mom. If I was a cartoon character I’d be asking for her address right now. OK, so WHO ARE YOU, ROD D.J.? I would consider granting you a mini-interview if you live in Toronto – a special treat for my fist “comic-Alina Fan”. Oh, Errol- HEY! You dressed me in the outfit i wear most often – you have the observant eye of a TRUE ARTIST! I vote for you!! @alina, alas, I am in far off, exotic Michigan. @Rod Downburst Johnson, Oh…. dear. This comic would be awesome is real life. It would be be most random thing, and it would make absolutely no sense, but that would make it great.